This year’s presidential election will be the very first that I am able to vote (as it only comes around every 4 years) and needless to say, I am not as excited as I thought I would be. From the viewpoint of a 20 year old liberal college student and given the choice between an extremely conservative Republican, Donald Trump and a conservative Democrat, Hillary Clinton, I would rather choose neither. But I, as well as many other Americans, are forced to make a choice in an attempt to ensure the White House is not taken over by a candidate that would leave irreversible damage to the State of the Union. The past year and a half leading up to the elections in November has not been a dignified exchange of opposing political views, but a fight to see which candidate can do the most undercutting and produce the most low blows; all of which has been sensationalized by American media outlets. In my opinion, this election will be the watershed event that encourages a shift in the Republican and Democratic party platforms and the rise of other political parties. After living in Montpellier for a few weeks, I have noticed a few differences. The first difference being the disinterest among my peers at the university I attend. While this obviously has much to do with the fact that it is the U.S. presidential election and not France’s election, I believe the candidates are laughable. There will be less interest where there is a notion that a situation is not being taken seriously, which has been the case with these 2 candidates and is not going unnoticed by the rest of the world. I have also noticed how less sensationalized the media is here. Rather than the hidden agendas and the portrayal of one candidate in a better light than the other, it has been a relief to watch from the eyes of slightly less biased bystander. While this does not make the elections look any less of a spectacle, it does provide a more clear and objective view as to what the candidates actually support and stand for. This election has definitely shed some light on the state race relations in the U.S. With terrorism, foreign policy and immigration being a few of the most important issues voters are concerned with, there has been a wave of xenophobia and islamophobia. Many forget or refuse to acknowledge that Islam is not to blame for terrorism, most immigrants and particularly those from Mexico and South American countries come to better their lives with access to better resources and to live out the American dream (some of the very things the country was founded on). What: The French American Center invites you to join us for our 2016 election breakfast. 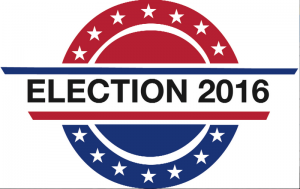 Come to observe the results of the U.S. presidential election, engage in discussion and of course, to grab a bite to eat!